This is a beautiful, rich layered butter cake filled with lashings of Salted Caramel Sauce and White Chocolate Buttercream. Sugar Salt Magic has reached a milestone. The blog turned 1. Woohoo! One year ago I put pen to paper (well actually, fingers to keyboard) and wrote my first post for what has become a very busy but very fun hobby. My initial aim was to combine my love of photography and food and to be able to share my recipes with friends and family and, of course, I get to cook for people all the time which I love. I’ve been amazed at how many have tried my recipes and at all the wonderful feedback and support I’ve got from you guys. Aww, shucks 🙂 Thank you so much everyone. Of course, I had to celebrate my blogiversary in style so I made a rich, decadent butter cake filled with all my favourite flavours. This butter cake is one of those simple things in life that are so good. So buttery and moreish. I’ve added loads of vanilla and a little lemon just to give it a little freshness. In between each layer and spread luxuriously around the outside of the butter cake is one of my new favourite buttercreams. I mean there is only one thing that makes butter cake better and that’s a gorgeous buttercream, right? Whipped White Chocolate Buttercream anyone? Yes, it’s whipped and airy and like sweet clouds of white chocolate. And there was no making my blogs first birthday cake without salted caramel. It’s one of the best things ever. It truly should be illegal and if you haven’t tried it yet, WHERE HAVE YOU BEEN? Go out and find some right now and try it. Better yet, take the 20 minutes to make your own and stick it in the fridge and then proceed to add it to everything you eat. Well, maybe not everything but you get the picture. I love this stuff. The recipe below includes my own salted caramel, made from scratch which is way easier than it sounds. This butter cake has it added to every layer and drizzled round the outside too so that it drips down the cake in all its gooey gloriousness. So what do you get a blog for it’s birthday, anyway? 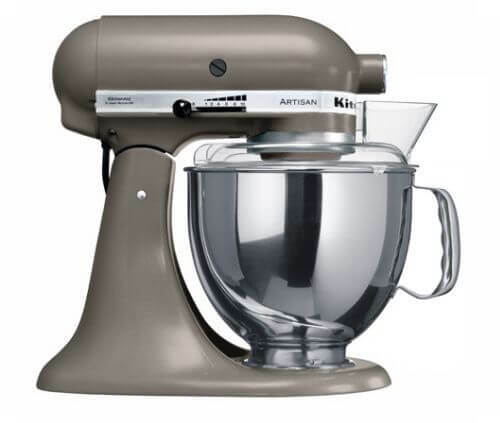 I have been umming and aahing about getting a kitchenaid for ages but I’ve had my trusty Kenwood for so long and what if Kitchenaids aren’t all they’re cracked up to be? Maybe there’s a better brand? What if I buy the wrong one? My amazingly supportive hubby and number one fan encouraged me to take the plunge so I did. You should have seen me whipping up the buttercream. Like a kid in a candy store. So far at Sugar Salt Magic I’ve tried to bring you a good mix of sweet and savoury recipes. I’ve posted everything from Choc Chip Chocolate Fudge Brownies to Sticky Harissa Chicken and everything in between. A few wings recipes (hmmm, that’s become a bit of a habit). A Slow Cooked Beef Stroganoff that so many people have tried and loved and has now become a regular in our dinner rotation at home. I remember the day I mastered doughnuts – check that out here. Cupcakes galore – too many to choose from. Cookies galore. And fudge. How I loooove fudge. And lots of salted caramel. Mwuhahahaha! Stay a while. Check out the site. Tell me what you’ve loved and what you want to see more of. And now to the best Vanilla Lemon Butter Cake recipe, my Salted Caramel recipe and my Whipped White Chocolate Buttercream recipe. Enjoy. To make the salted caramel sauce: Place the sugar and water in a heavy based saucepan over medium heat and stir gently until the sugar dissolves. Bring it to the boil and stop stirring. Allow it to boil for around 7-8 minutes, without stirring. The temperature should reach 120C on a candy thermometer and it should be amber gold in colour. Add the butter. Whisk it in quickly until fully combined. Now add the cream (be careful as it may splatter and bubble up) and do the same until all mixed through. Allow it to boil for 3-5 minutes until thickened and glossy. Remove from the heat and quickly stir in the salt Allow to cool. Place in a sealed jar in the fridge until ready to use. You will use about a third to half of this batch for your cake and the rest can sit in your fridge for up to 3 weeks – if you can leave it that long. Sift together both flours, salt, baking powder and baking soda. Mix well and put aside. Beat together the butter and sugar until light and creamy. Add the eggs one at a time, beating well after each addition. Add the yolk, lemon zest and vanilla and beat well. Make sure to scrape down the sides of the bowl as necessary so that everything mixes evenly. Add 1/3 of the dry mix to the wet mix and mix by hand gently until just incorporate. Now add ½ of the buttermilk mix gently. Mix the rest of the flour and milk in the same way until all done. Make sure not to over mix or the finished cake will end up dense. Pour evenly into the two tins and bake in the oven for 30-35 mins until a toothpick comes out almost clean. Allow to cool in the tins for about 10 minutes before turning out onto a wire rack to cool completely. For the Whipped White Chocolate Buttercream: Place the chocolate into a microwave safe bowl. Heat in 30 second increments, stirring well between each. When there are just a few lumps of chocolate left, keep stirring until it all melts together. Put aside to cool for about 10 minutes. Beat together the butter and sugar in a large bowl until light and creamy. Make sure to scrape down the sides from time to time. Pour in the cream and vanilla and beat on low and mix until fully incorporated. Now pour in the cooled white chocolate again until incorporated. Increase the speed to medium-high and beat for a good 3 minutes until it looks very light and fluffy. Warm the caramel sauce gently in the microwave until just runny enough to drip down the edges of the cake. Don’t allow it to get too warm or it will melt your frosting as you pour it on. Once the cakes have cooled, carefully slice off the top of each to make them flat. Spread one third of your buttercream over the top of one cake. Drizzle a couple of tablespoons (or to taste) of the salted caramel sauce over the buttercream. Lay the second cake on top. Use a spatula to spread the rest of the buttercream all over your cake and smoot out to the thickness you like. Make sure the top is nice and smooth and carefully pour spoonfuls of the caramel sauce right around the top edge of your cake allowing it to slowly drip down the sides. Decorate as desired, slice and serve.